Twenty-five years ago, I walked into a consignment shop in the Queen Anne neighborhood in Seattle, and spotted this putter. At a time when they were giving away hickory shafted club for practically nothing, this was priced at $40 which I thought was a ridiculously high price. But I liked it. I had never seen one like it, and on the head it said: ” R. JOHNSTONE, GOLF CLUBMAKER, SEATTLE”. Locally made: that was cool. On the shaft was taped a label of the previous owner: “Sand Point C.C., Max E. Lattell”. That too was cool. Later I was to learn that indeed Max was a member of Sand Point who died on 8/8/88. And, remarkably, he was 88 years old at the time. Later still, I was to learn about the long illustrious career of Robert Johnstone, golf professional at the historic Seattle Golf Club from 1905 until his death in 1937. Born in North Berwick, Scotland in 1874, Johnstone emigrated to America in 1900 and arrived in San Francisco with Willie Bell, another young golf professional. He was hired as the golf professional at the Presidio Golf Club, a course which he would soon redesign. Later he would design the Ingleside Golf Course in San Francisco. The Presidio at that time was still a military property, and it was not uncommon for the cavalry to conduct their exercises on the golf course. Perhaps tiring of the constant damage to his course under the horses’ hooves, or perhaps the Northwest reminded him of his home in Scotland, he left the Presidio to become the professional at the Seattle Golf Club. In his 32 years in Seattle, Johnstone was instructor, course architect, clubmaker, mentor, and story teller. He was also a competitor and a champion having won the California Open and the Northwest Open multiple times. He founded the Pacific Northwest Professional Golfers Association and served as its first President. 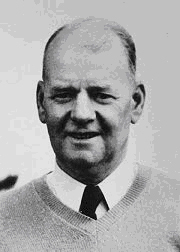 The PNWPGA elected him to the Hall of Fame in 1982. As an architect, he designed the new Seattle Golf Club at the Highlands, Jefferson Park Golf Club, Rainier Golf and Country Club, and collaborated on the design of numerous other courses in the Seattle area. In 1913, following Francis Ouimet’s win at the U. S. Open at Brookline, Harry Vardon and Ted Ray travelled west to play in a series of exhibition matches against the best golfers the local golf courses had to offer. Vardon and Ray made their way to the Seattle Golf Club where they were matched against Johnstone and “Long Jim” Barnes, himself a future multiple major winner. In a tightly fought match, Vardon and Ray prevailed 1 up on the 36th hole. 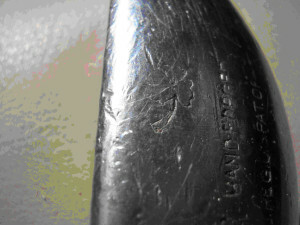 I like to think that Johnstone ordered or crafted this putter after seeing Vardon’s own. I will never know. The cleek mark is a puzzle. It appears to be a four leaf clover, but it is not a MacGregor clover. 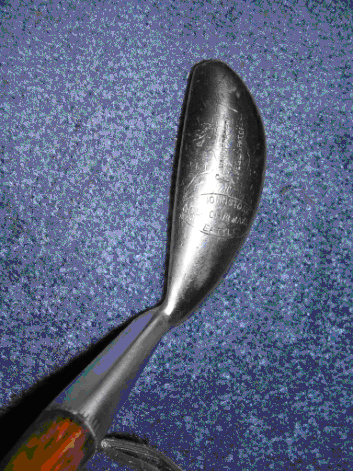 On close examination, it appears to be hand etched, which adds to the puzzle. I don’t have the answer, and I would certainly welcome any information.